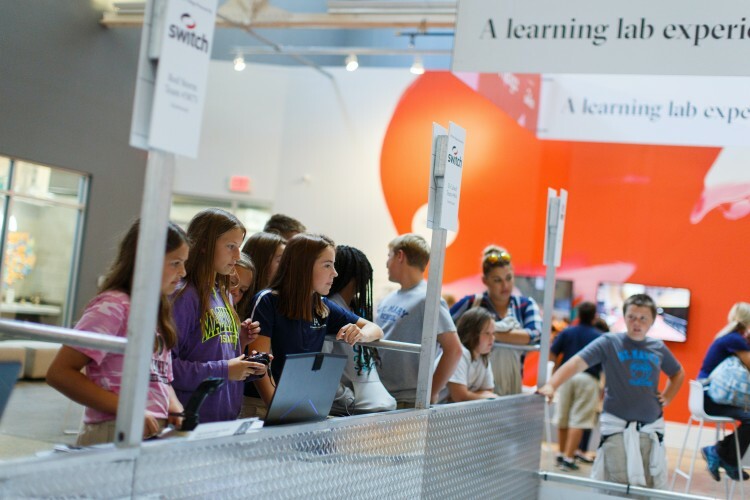 ArtPrize visitors will practice creative problem solving through STEAM-based challenges, featuring Air Zoo, FIRST® Robotics, the new ArtPrize collectible Discovery Deck, STEAM Mobile Lab and more. GRAND RAPIDS (Michigan) SEPTEMBER 4, 2018—ArtPrize, the independently organized international art competition recognized as one of the world’s largest public art events, today announced plans for the 2018 STEAM Lab, powered by Switch, the global technology infrastructure corporation that is powering the future of the connected world®. The STEAM Lab will underscore the power of art and creativity in science, technology, engineering and math at the ArtPrize 10 Visitor Pavilion at Rosa Parks Circle. The ArtPrize STEAM experience returns for a third year, taking over a reimagined shipping container placed in the epicenter of ArtPrize 10—where visitors will have the opportunity to participate in unique STEAM-based challenges throughout the 19-day event. Additionally, the new STEAM Mobile Lab will bring these challenges out into the event district, meeting visitors where they are. For details on 2018 STEAM Lab activations and events, download this fact sheet. ArtPrize is slated to return to Grand Rapids for its tenth edition from September 19 to October 7, 2018. The event will feature over 1,270 artist entries from 41 U.S. states and 40 countries, showing at 165+ venues across the three-square mile event district.